This is possibly the first of many busloads of illegal aliens trying to enter the U.S. by flying in over the new Trump Wall. Moonshine, Illinois – Top scientists from our top-notch science department are warning that a large school bus believed to be full of illegal aliens will be passing between the Earth and the Moon soon. It is not known who if anyone is drinking while driving this bus nor whether or not it will be just passing on through, making subsequent secondary passes, or perhaps even make a stop for supplies and maby even an extended visitation without representation. 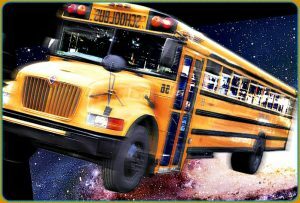 The well-respected Dr. Goytam Tesfalem believes that these so-called illegal aliens might even be trying to 1. either leave this sector to escape paying back taxes, or 2. use the space bus to get over the Trump Wall and freely enrolled in Obamacare. Spaceologists are wanting to point out that the space-travelling busload of alien freeloaders will be visible during upcoming night skies and there is even a chance they may land in your back yard so you might want to stock up on a variety of refreshments so as to be prepared and not seem like you didn’t expect to be having some unexpected guests drop in directly from space, the penultimate frontier.